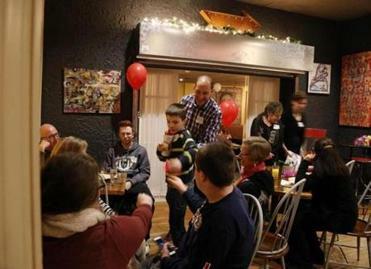 Alysia Abbott&apos;s son Finn with her husband, Jeff, and daughter Annabel find a warm welcome at Deluxe Town Diner in Watertown. 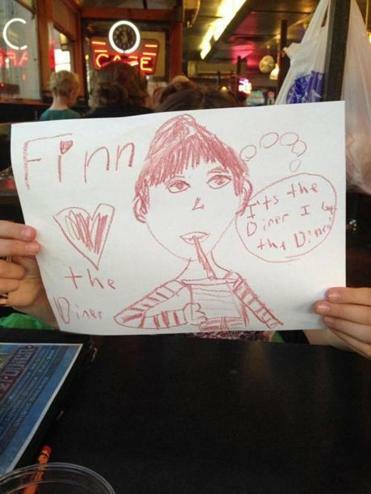 Annabel’s drawing of Finn enjoying the diner. 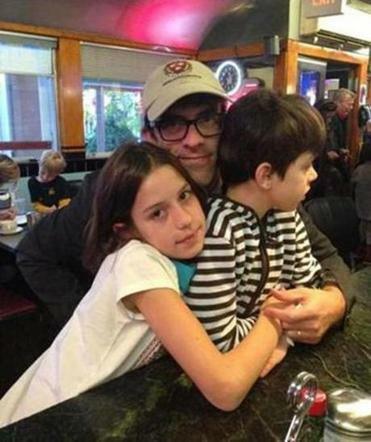 Since moving to West Cambridge almost five years ago, we’ve been coming to your diner about once every week or two, but I never explained exactly what these outings mean for my family, and it is time that I do. Like many parents, I can feel beat down by the nightly task of making a delicious, nutritious dinner that everyone will eat. I yearn for the occasional night out where someone else will refill the drinks, wipe down the tabletop, and pick up the crumbs and broken crayons from the floor at the end of the meal. But there are few restaurants where my family can comfortably spend an evening. There is, in fact, but one establishment, and that one is yours: The Deluxe Town Diner in Watertown. As you know, my son Finn is autistic, but not “Rain Man” autistic, with a flat vocal affect and quirky obsessions. Finn is nonverbal with impulse control issues that, on the surface, resemble those of a toddler. He’s prone to yelping and wandering, to standing on the booth or lying on the table. Like a toddler, he has “busy hands” and might open a packet of sugar or yank on the blind-pull over and over, even when repeatedly told not to. Unless I interfere, he’s been known to approach large, strange men in order to pet their faces. He likes the prickly feel of a 5 o’ clock shadow on his fingers. Finn’s also capable of impressive tantrums, biting, pinching, or kicking if he’s frustrated. This sort of behavior was easier to explain away when Finn was little — the terrible twos! What are you going to do? But he’s 8 now, quite strong, and quite tall. Looking at Finn, some people don’t see a child with a diagnosed behavioral disorder. They see a child that’s out of control, and a parent who’s not doing her job. His disability isn’t immediately recognized as a disability. Finn’s pinches hurt, but not as much as the unwanted attention these behaviors inspire, especially when his disruptive actions come at the expense of someone else’s quiet evening. In these moments, I want more than anything to disappear, to blend into the crowd, and I just can’t. This is why we don’t go out to restaurants, even “family restaurants,” where the noise and chaos can set my son running. Families with a child on the spectrum can enjoy a restaurant gathering in a nonjudgmental atmosphere. But we, and especially my older daughter, Annabel, want to have time out as a family. Thanks to you, we can. 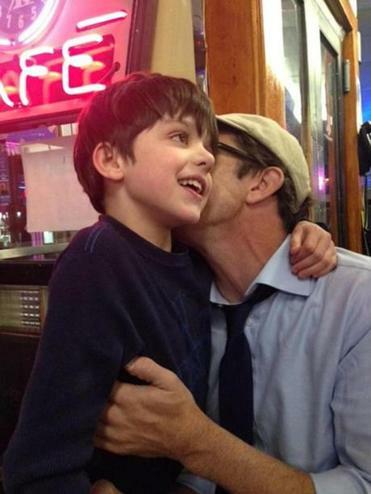 Since we moved to the neighborhood, and first explained Finn’s diagnosis, your staff has smiled at my family when we enter the diner. You understand why we need a corner booth, why we need oyster crackers before the food arrives, why Finn might need to get up and sit at the counter to watch the fry cooks stir steaming bacon while our food is being prepared. You’ve welcomed the part-time therapists and personal care assistants, who can’t order food but are there to help manage Finn’s trips to the bathroom, since he’s still in diapers. As Finn grew, you commented, “He’s so tall . . . and good-looking!” If another table looked at our large, flapping boy with confusion, for once I could breathe easily because I didn’t feel the need to stop and explain our son. We’d already explained him to you and that was enough. I can’t overestimate the value of that smile of recognition offered to us each time we come to the Deluxe Town Diner. The experience of being truly seen, autism and all, and yet still accepted is profound. My husband and I often split up to go out, one of us staying home with our disabled son while the other accompanies our daughter, or we pay for a babysitter to watch Finn so we can enjoy the sorts of activities we took for granted before he was born — going to the museum, to the movies, or to friends’ parties — without the sudden need to pack up and leave because of a violent outburst. But with you, and only with you, I don’t feel burdened by that stress. You make us feel that our patronage is just as important as anyone else’s. It’s a gift to know that only 10 minutes from home, on the sunniest Saturday afternoons, or on the darkest nights of winter, we can be welcomed with 24-hour breakfast, the TV turned to the local news, and the speakers playing comforting classic rock. Some special-needs families rely on grandparents and other relatives to help ease the burden of parenting. But my husband’s mother recently passed and his father lives on the opposite coast, and my own parents passed away before I was 22. The Deluxe Town Diner is the closest we have to family in the neighborhood. So thank you. 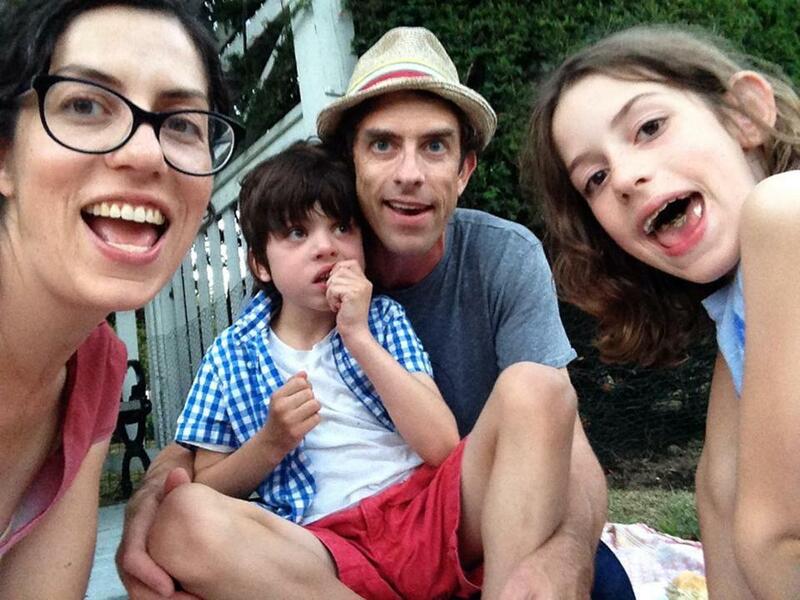 Pictured: Alysia Abbott, Jeff Howe, Annabel Abbott Howe, and Finn Abbott Howe. Alysia Abbott can be reached at alysiaabbott@gmail.com.